MultiTAP™ is the result of collective years of Emuge’s extensive tapping expertise and application research. It features a completely new, innovative geometric design and a special base material and surface treatment, allowing it to handle numerous materials and applications. Emuge has designed MultiTAP to offer job shops and other manufacturers an affordable, yet high performance tapping solution. 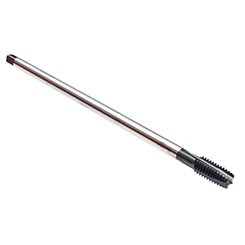 MultiTAP is the ideal tap for a job shop or a manufacturer who works with short- and medium-run threading applications across a wide spectrum of materials. It will significantly improve thread quality and boost output while reducing production costs, because one high performance MultiTAP will handle most common materials and applications. MultiTAP eliminates the need to stock numerous types of taps in the tool crib. MultiTAP will cut a wide range of materials including carbon steel, steel alloys, stainless steel, aluminum, cast iron, copper, brass, and bronze. MultiTAP is also uniquely designed to produce threads within both 2B and 3B classes of fit, eliminating the guesswork required when calculating H-limits.